I was in NYC in August this summer, doing a short 4th year medical elective at the Center for Transgender Medicine and Surgery. I did some couch surfing, and stayed at an Air BnB in Williamsburg my last week. Medically it was an outstanding experience, and in my dream future, I will get to be a physician working at this clinic in Manhatten. Being away from home, I realized how much I rely on having my own kitchen! Making my lunch is I keep my body feeling good despite spending most of my time working in a hospital or relaxing in bed. What do you do for lunch every day? By lunchtime every day, I will eat basically anything. I sometimes eats my lunch at 10:30 AM I am so hungry. The more glucose my brain is burning, the more I need that hit of fat, phytonutrients and fiber. Therefore, my cunning plan is to eat super healthy sometimes boring basics for lunch – lots of veggies, good quality fats, high fiber fruits, raw vegetables and very few processed carbs. Then, I dont have to think as hard about what’s for dinner and still maintain a good nutrient balance. So, what do I actually eat? Greens and grains, with cheese, avocado or nuts/seeds and random chopped veggies like carrots, cucumber, tomato, radish. In summer I love to put flowers in my food. A grain free diet is popular with the keto crowd, but I advocate to have at least a few cups of whole grains in the diet per week. 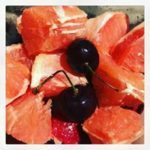 The fiber, magnesium, B vitamins and serotonin release metabolically help keep the mind-gut axis regulated. We rotate our grains between short grain brown rice, wild rice, quinoa, and millet to maintain variety of flavor and nutrient profiles. I heard once in a conference lecture that nutritional studies were done evaluating T4 –> T3 conversion activation (active thyroid hormone.) Subjects were fed fat based diets, protein based diets or carbohydrate (CHO) based diets. Only the diets with carbohydrates evidenced thyroid hormone conversion. 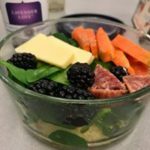 Since I am a huge fan of having optimized T3 production for an effective metabolic mileau, I advocate for having a moderate amount of whole grains in ones basic nutritional foundation.I wish I had the study in-hand to back this up but I dont; maybe once I am out of medical school I will have time to research these things more fully. The bottom line is that whole grains are good for health and tasty and I like them in my lunch. They are filling and delicious and beneficial. 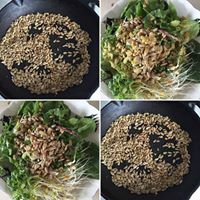 I like to layer the grains on the bottom, then a huge handful of greens – whatever has the latest expiry date when I am shopping! 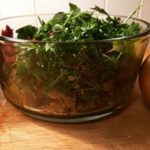 We rotate spring mix with herbs, arugula, baby spinach, crispy green leaf lettuce, and occasional kale salad (leftover.) I need fat with my lunch to feel satisfied, so I douse the whole thing with yummy olive oil and a delicious vinegar like balsamic or umeboshi or fire cider vinegar. Then, I add some protein: cheese is the easiest and I love cheese. Tuna, egg or chicken salads are always a win too. I also love toasted walnuts, pecans, pumpkin seeds or sunflower seeds. I buy them raw, and toast them in a dry cast iron pan until they are warm and smell nutty but not burnt. Make sure to stir! I store these in glass jars in the cupboard. The pumpkin seeds are best toasted with some Chalula hot sauce and cumin! Yum. These add a crunch, some richness, protein, and delicious essential fats. Finish the lunch with 2 chopped veggies for color, fiber, and variety: an organic carrot, cucumber spears with pepper, pepper slices, whatever floats your boat. 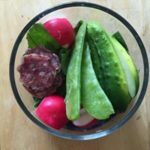 If you are a hard paleo and refuse grains, or if you are like me and sometimes need a second lunch or a hearty snack then organic nitrite free salami is a good addition. It is filling, savory, and works well with olives, carrot rounds and other veggies for finger snacks. Just veggies is not enough for me. Lunch Plan B: huge leftovers fan here. If I go out to dinner, I almost always save half for lunch the next day. This is a win-win, because I stop eating when I am full (or save room for dessert) AND I have a pre-made meal to go. I hate waking up extra early to deal with lunch, so I usually get lunch ready the night before. 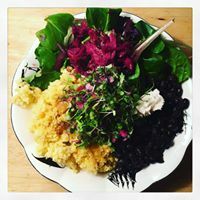 We generally also cook for more than two, planning a lunch or two and maybe even a supper into every meal we co-create. Leftovers are exciting to me because these are usually rich yummy comfort foods like pasta, steak, curries and other “real meals”. Finally, making lunch saves me money. The first day of my August rotation I went to the nearby Whole Foods for lunch. I wasted 15 minutes wandering around the hot and cold bars, trying to figure out what to eat. My $15 salad ended up being an awkward mish-mash of flavors that did not blend well. That day after work I went and bought $40 worth of groceries (almond flour crackers, apples, greens, cheese, nuts, yogurts and paleo granola for breakfast) and brought my lunch to work every day for the next week, supplementing with enchilada leftovers. Bringing your lunch ensures you know exactly what you are eating. It keeps you committed to your intentions with food, and lines up the healthy choices for you in moments of “Im Starving” brain meltdowns that would otherwise allow for easy Trash. It is also a great way to plan your daily insulin for diabetics! Finally, it frees up dinner for more social food activities that may be less greens and grainy. Oh, and bring a snack, maybe two. For Fall and Winter I find an apple is the hardiest fruit. Combined with nuts and raisins, it’s a great choice. Someone once said, if you dont want to eat an apple, you are not actually hungry. This holds true as long as your teeth are in good shape. In winter and summer, cut up fruit like citrus or stone fruits an berries are refreshing and delightful. I also love dried mango slices from Trader Joe’s. 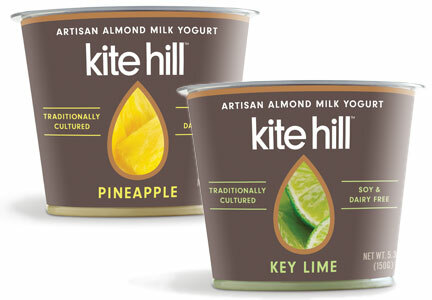 If you crave yogurt and aren’t having it for breakfast, it’s a good option too. 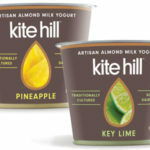 I love the dairy-free yogurts too like soy, almond and coconut singles, which are far better choices than anything a vending machine or a cafeteria might offer. My basic formula is eating good quality food 65% of the time. Then I can easily process about 35% cheeseburgers, nachos, pizza, sweets, and other junk. To change your body composition this may need to become more like 75:25 and exercise has to be added in. I eat at least 60% of my daily food at work between 9-5pm. If I make sure these foods are healthy, wholesome and invigorating to my brain and bowels, my nutritional work is done for the day. Yay!